Transform your home’s curb appeal by re-purposing old gutters into attractive windowsill flower boxes. Simply cut the gutters carefully to the desired length to fit on your windowsill. Cap off the ends, drill a few holes in the bottom for drainage, and fill with potting soil and plants. If you aren’t happy with the color of the gutters, simply spray paint to suit your needs. It’s an easy, affordable way to beautify your home and recycle old gutters. Make simple, effective organizers for your garage, basement, or shed by cutting long gutters into smaller sizes. Cap off the ends and then attach them to the wall or back of a door. You can safely store screws, nails, twine, small hand tools, and just about anything else that fits inside and isn’t too heavy. It’s a durable, affordable alternative to pricey storage units. Use a mallet to flatten out a piece of galvanized steel gutter. Soften the edges so that they aren’t sharp and hazardous, then attach the sheet to the wall. Add a few magnets, and you have a quick and easy message board for important notes. 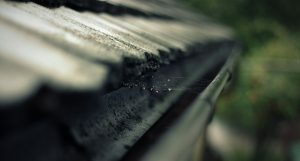 Before you toss old gutters into the recycling bin, try these easy and creative ideas. You’ll be able to usefully re-purpose them.